The Twitter user is a unique beast. Most likely to be between 18-24 years of age, they use Twitter to alleviate boredom and receive ‘insider information’, and are not motivated by deals when deciding who to follow or tweet about, but some of them will purchase as a direct results of a tweet. 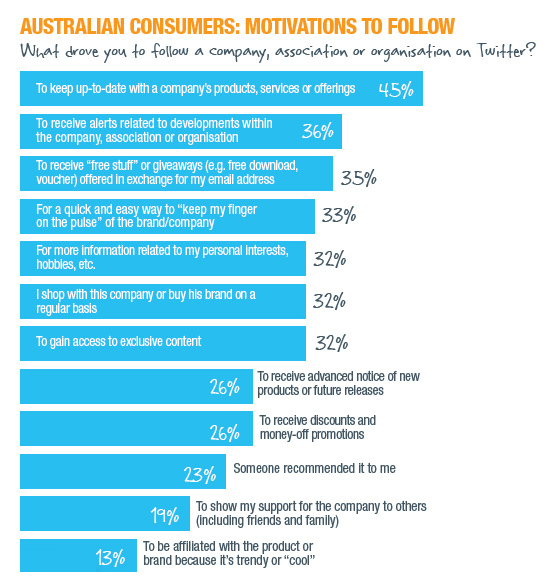 While Twitter is used by far fewer Australians than email or Facebook, with only 11% of online consumers a member of the service, it is still a valuable way to connect with consumers, according to ExactTarget’s ‘Digital Down Under’ report. Users of the micro-blogging service are more likely to be ‘influencers’ and use Twitter to receive ‘insider information’ from friends, brands and celebrities, which they are then likely to talk about on blogs or other social media. The search for exclusive content is premeditated, so they can share the information with others and build influence with their own followers. Unlike many of their consumer counterparts, ‘influencers’ on Twitter are not looking for a deal, the report says. While monetary incentives work well as motivation to engage on Facebook and through email, it is not as likely to inspire users to take action on Twitter. The ability to tap into influencers may be the most powerful way to use Twitter; according to the report only 5% of online Australians have made a purchase as the direct result of a marketing message they received through Twitter, a figure that rises to 12% among 25-34 year olds. The study, conducted in March with a sample of 1200 Australians, found that unlike email and Facebook, Twitter isn’t typically seen as a place to work or connect with friends. Users tend to view the channel as a way to alleviate boredom and receive what they perceive to be ‘insider information’ from friends, brands and celebrities. They’re also characterised by a strong desire to connect, educate and share resources and information with others online. When it comes to following brands, the desire to stay up-to-date dominates with 45% following to keep up with company announcements. 35% follow to received giveaways and 26% to received discounts or promotions, figures which put this driver further down the chain when compared to behaviour on Facebook. The report notes that users have become more selective about which companies they follow, but remain loyal to those they find most relevant or entertaining and that it’s common for users to vet and reassess who they follow. Once a brand’s tweets are deemed useful they command high levels of attention with more than 50% of Twitter users always reading posts from their favourite companies. Of those who are active on Twitter, 51% check it at least once per day, and 18% report using Twitter consistently throughout the day. Twitter users are active across other channels too – 70% check Facebook daily and 84% check email daily. The most active users are those aged 18-24 years, among whom 18% of the online population are members.